You must make reservations at least 5 minutes in advance of the time at Salacia Prime Seafood and Steaks. When perfection is paramount, Salacia offers a dining experience for those with discerning tastes and seeking the highest in quality. Honored with distinctions such as Virginia Beach's Only oceanfront AAA Four-Diamond Steakhouse, recipient of the Wine Spectator Best of Award of Excellence, Salacia has been recognized for its culinary delights and extraordinary service time and time again. Requests will be happily noted, but reservations only guarantee a table, not a specific location. Dress is business casual for gentlemen, collar shirts required, no distressed jeans, athletic attire or beachwear permitted, ladies and children over eight years of age are required to dress accordingly. Due to the intimacy of the dining room, we do not permit high chairs or children under eight years of age. The service was slow. 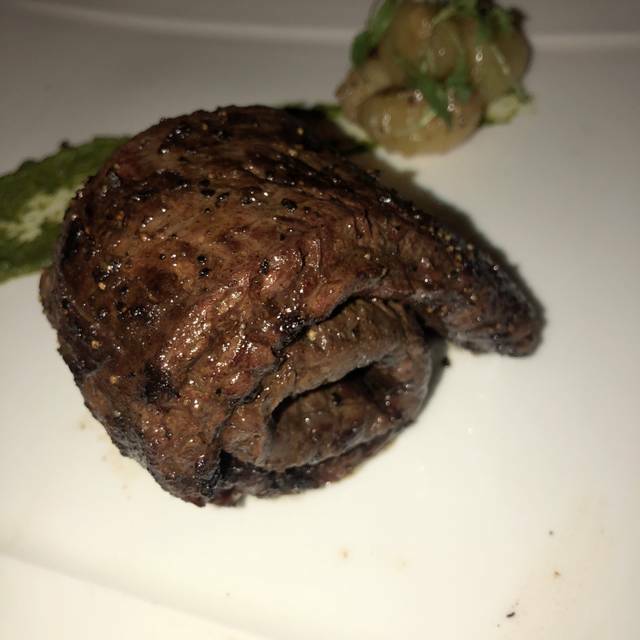 My husband ordered a very expensive steak Med rare, came out like shoe leather. I ordered the special oysters and got oysters rockefeller instead. My husband received his food several minutes before. For such a swanky place, the food and service leave a lot to be desired. We ended paying for our drinks, the manager should have comp the entire meal including drinks. The customer is always right and should never pay for bad service. Victoria was amazing. The atmosphere was just right, the wait staff was very attentive...we will be back. This was our first time at Salacia. We will be back, great atmosphere and a perfect view of the ocean. It was my birthday and it was a delicious dinner. My husband & I had date night on a Sunday & this was the perfect place!!! Very quiet. A very intimate private room maybe 10-12 tables. We were the only ones at 6pm by 6:30pm two more tables so we were able to have conversations very easily. Very attentive wait staff. We were able to sit next to the windows overlooking the ocean & boardwalk. It was a drizzly day but still a pretty view. We both had steak & it was cooked to perfection & the sides were wonderful. The waiter was able to recommend a perfect glass of wine to complement the meal & my wine preferences. The waite service was excellent. It took forever to get our appetizer. I assume that it fell through the cracks, because we received an apology, from the captain, and a second appetizer for free. Overall a good experience. This was my second time there. Great food and service. Quiet, intimate spot with views of the beach. Pricing equivalent to CHI/NYC steakhouses. Server very well-versed with wine list. Hope they get more traffic; gem in V.B. The service throughout the meal was outstanding, and the room itself is lovely. My chicken dinner was somewhat dry, as was the spinach. I can heartily recommend the lobster bisque and the wedge salad. This was the second time we celebrated our Anniversary dinner here. Wonderful food and great service! Excellent place for a romantic dinner date for anyone. The staff is extremely professional and attentive. Had a great time with my wife. My wife and I spent our anniversary here and it was a great experience. Service was fantastic! We’re definitely coming here for our next one. We spent it inside though I’ve heard great things about the outdoor experience. Next time we’ll be outside. The food was impeccable. I had the filet mignon and it cut like butter and was absolutely delicious. Highly recommend this restaurant for 2 party dates or anniversaries. The manager, CJ was amazingly hospitable. Staff was very friendly and professional. A great place for date night. Food was really good but the service and cost outweighed the good steak. I’d rather go to Butcher’s Son for a nice steak dinner. More reasonable prices and better service. Was very unpleasantly surprised. i cannot believe that i was charged $5.00 for Steak SAUCE when my wife asked for steak sauce to accompany her $45 filet. the service was lovely, wine was good and fairly priced for restaurant, BUT to be charged for that totally changed my view of the experience. i would clearly NOT recommend this place to anyone due to their ridiculous policy and practice of charging for steak sauce!!! REALLY??? This restaurant came highly recommended. It is located in the back of Catch 31, which is more contemporary and loud. The ambiance was lovely. It is very small and quaint. One waiter for the whole place. He was friendly and nice. We started with a bottle of wine and 2 appetizers. They brought out a selection of bread to choose from and some herbed butter. The bread was warm and tasty. Our first appetizer, the lobster tempura was good. The batter was a bit heavy for our taste buds. The bone marrow appetizer was outstanding! The best we've ever had, highly recommend. The waiter was wonderful paced us so that all our food didn't come out at the same time. He even asked as at the end of finishing our appetizers if we were ready for our entree., which we were not. We let him know when we were ready and he brought out the 25 oz. Kansas City Chop, which is a super thick cut of beef, similar to a bone in Strip. We also ordered a Perigourdine sauce to go with the steak, and some Asparagus gremolata. The steak and sauce were delicious. We did not care for the asparagus as it tasted a bit charred/gas flavor. We mentioned it to the waiter who immediately offered to bring us something else. We declined as we were getting full. He did not charge us for it as we didn't eat it. We ended our meal with the baked Alaska, which our waiter surprised us with. It was delicious, a wonderful treat to end a great meal. I would highly recommend this restaurant. I haven't had a steak this good in a long time. One of the best steaks in Hampton Roads. Nice dining area, but not amazing. Fantastic service. The food was very beautifully presented and tasty, but the real standout was the spectacular service. Fantastic meal and service! The manager even came to our table to wish us a Happy Anniversary. The food was absolutely delicious and the portions were more than ample, so much so that we regret not having room for one of the sumptuous looking desserts. We dined looking out on the moonlit ocean which made the romantic evening complete for us; truly an evening to remember. Salacia is truly an unique dining experience. The restaurant is elegant, quiet and comfortable. The service is impeccable, gracious and unobtrusive. Very nice wine menu. Delicious appetizers. Steaks are made to perfection, Best in the area. The Truffle Lobster Macaroni and Gruyere Cheese is amazing, enough to share. Baked Alaska is pure decadence. The cocktail jazz they play never rises above a murmur. We truly enjoyed our entire evening. It was apparent that the restaurant values offering customers an elite service experience. Our second course was served while we were just starting to taste our initial introductory dish. In addition, the gnocchi dish and the filet were served cold. The couple at a table next to ours experienced the same issues. However, the food’s flavors were excellent and the manager was attentive to fix any issues. This is one of our favorite restaurants when I Virginia Beach! Good dining experience during our holiday vacation. Service was outstanding and ambiance was delightful. Steak wasn’t as good as expected, not prime but waiter said it was top quality which we thought didn’t stand up to our standard. Not inexpensive and worth going on special occasions. We go to Salacia a few times a year. It's become a holiday tradition for our family to eat here then go see the lights. It's a nice quiet, small restaurant. We really enjoyed everything we ordered. It's a little pricey, but we think it's worth it for the ambiance and great service. I will definitely be back. The food was delicious & it was a lovely, romantic setting. I've had fine dining at many establishments around the country. Having said that the value of the food did not match the atmosphere and service which was excellent. But then, that was the primary reason I wanted to go to Salacia in the first place. It was a great evening of dining. Drinks were perfectly shaken. The waiter let pave our meal out to enjoy the evening. Flavors of each dish was excellent from the appetizers to the steak. The service was above and beyond. The server had all of our needs taken care and made our special night that much better. I would recommend this place to all my friends. Amazing views and outdoor seating. It's like a nice Florida restaurant. Service was very professional but a bit callous, especially never asking if food was okay or cooked to temperature. Poor quality for shrimp and salad components, including tomatoes and Kraft dressing. Mashed potatoes had lots of garlic even though garlic not in menu description; waiter didn't care that we didn't eat them. Steaks not cooked to requested temperature, even after sending back for more cooking and then no follow up from server. Steak texture and taste was lacking and seemed to be low-quality. But outdoor ambience was amazing. Visiting this area for ten days and ate here 3 times because it was so good and enjoyable.